Christmas is fast approaching and no one can stop it, specially for bringing exciting promos from various brands of food, hotels, clothing and vehicle. 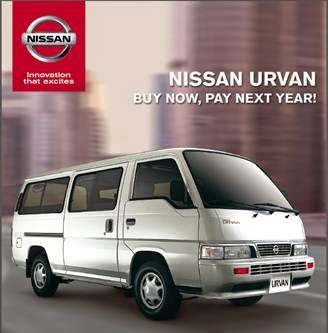 Yes, you heard it right because from October 29 to November 30, 2014, if you buy a Nissan Urvan now you can get to pay for your first amortization 90 days later. Vehicle/s is very important, specially for entrepreneur or business owners. Transporting products from one place to another is a vital factor to consider and owning a reliable vehicle is essential. Nissan Urvan will never fail to bring you that. “Transportation has always been very crucial for businesses. We, at Nissan, are acknowledging this need and we are catering this through Urvan. We aim not only to be their primary means of transportation, but more than anything, their actual business partner,” said Antonio Zara, President and Managing Director of Nissan Philippines, Inc.
With partnerships with East West Bank, Maybank, and Luzon Development Bank, interested buyers can get to choose from the Escapade (12-seater), Shuttle (15-seater), and VX (18-seater) and can pay for as low as P27,347 monthly. Not only that, buyers can also enjoy free LTO registration, free 1 year Comprehensive Insurance, and free Chattel Mortgage Fee. For more information, visit the nearest Nissan dealer near you.